Seriously, there is a conspiracy against jury pool W. Some of the other groups have served for only half a day out of the nine days that we have been on jury duty so far. On the other hand, old group W has been here five out of the past nine days. Actually, some of group W has been here even longer, having been selected for two juries so far. I've only served on one jury thus far and spent the rest of the time just waiting around to see if I will be selected. Our longtime truck, Bruce, is officially retired. Well, he isn't really retired, but we just sold him to make room for the F150 4x4 that is our new truck. Bruce was a great vehicle and took us everywhere we needed to go throughout graduate school and law school. He moved us from Michigan to Oregon and back again, throughout the Northwest, and even down to the Southwest. He saved us from a windstorm in Death Valley when we had to tie our tent to him. I slept in the back of Bruce on my way out to a week of solo backpacking in New York. He went to pick up Casey at the cattle ranch in Oregon. He's hauled us safely around for many, many miles--we'll miss you Bruce! I'm at a conference in Grand Rapids for the next few days. I had some extra time so I hopped on a treadmill in the hotel. My plan was to run for a couple hours. I did about 7 miles on Monday so if I got 12-13 miles in today I would be all set for a long run this weekend. I had my mp3 player, some Sharkies for sustenance, and a water bottle. I quit after 7 miles. There is just something about treadmills that I cannot do. I'm not sure why I get bored so quickly, but there is just something about staring at a wall that just wears me out. Anyway, I'll just sneak in another 6 miles or so tomorrow and still be on schedule for my weekly mileage so it's not a big deal. On the bright side, the short run gave me time to settle into my hotel room, eat some sushi, and finish a short article for Ultrarunning magazine that I've been working on. Yes, I'm taking my first step towards merging my professional life and personal interests with a somewhat sociological article discussing the role of online media in shaping ultrarunning culture. I've already sent an inquiry to the editor and she was interested in the article. It is not (I hope) too heavy on the academic stuff, but hopefully it will represent an interesting read. Okay, I'm not speed, but Elliott is really convinced that I am. 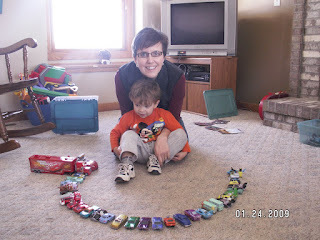 Actually, I think he is convinced that I am able to run as fast as one of the 38 race cars that he has now accumulated from the Disney Cars movie (see above). Only a couple weeks into my training program and already my running has been hit and miss. Last week, I didn't run at all until Friday, when I got 10 miles in. This was followed by 20 miles on Saturday--I managed 10:00 minute miles, which is not great, but reassures me that I haven't fallen too far out of condition (speed is relative after all). Monday, Elliott and I headed out and cruised through 12 miles. "Don't walk, Daddy! I want to keep going!" he said at the end. Sounds like my training is going to consist of a lot of long runs... Seriously, everyone should have a 2 year old committed to a Disney movie about race cars as a trainer.